Ging Tea Estate is only a 30-minute drive from Chowk Bazaar, the lower town area of Darjeeling. This rolling tea estate spreads across an area of 600 hectares on the slopes of Darjeeling hills with altitude varying between 2,000ft to 5,000ft. However being a bio-organic garden, 60% of the estate has been left uncultivated to retain the ecological balance. The uncultivated areas mainly comprise of natural forested land full of flora and fauna. Ging is part of the well known Chamong Group. The estate employs around 600 workers and the tea sold from this garden is branded under Chamong for retail in India. However most of it is exported under the name Ging itself. This is one of the oldest plantations in Darjeeling Hills. The Ging Tea House is a British planter's bungalow which was originally built in 1864, and now restored & renovated to its old grandeur. 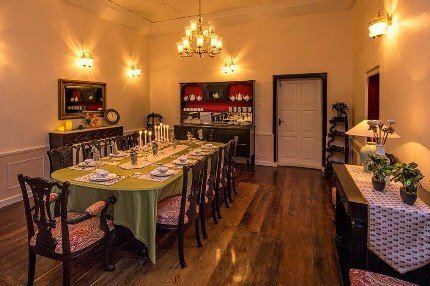 The Tea House is now offered to tourists to enjoy a tea garden life which was once a privilege only for the British planters and later for the Directors of the company who owned the estates. 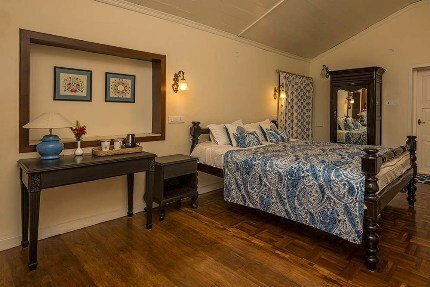 The bungalow has all-wooden floors, high ceilings exposing the rafts and antique furniture & drapes that collectively recreate the aura of the period. There is a nice lush lawn in front of the bungalow, a small gazebo across the lawn at one corner, and an open viewing deck in front. On a clear day, the view of Kanchenjunga snow peaks from the lawn and the viewing deck is simply magnificent. You can have your breakfast served at the gazebo or at the open viewing deck. There are six private suites, all very tastefully done up. In-room amenities include Flat Screen TV with digital channels, electric kettle with complimentary tea/coffee, hair dryer, room heaters, spacious attached baths with modern amenities, geysers, toiletries etc. 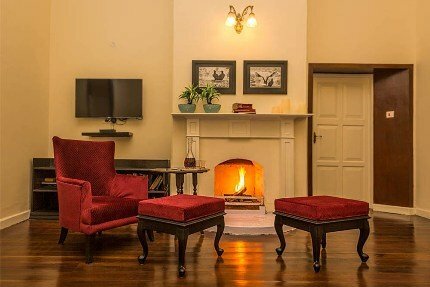 The suites also have fireplaces which can be lit up on request. There are 11 staff in the Bungalow and few of them speak good English. They also have a host in the bungalow who is the manager as well and she is available on call at night for any emergency services. The dining hall is spacious and attractive. The food offered for breakfast is Continental - cereal, fruits, sandwiches, eggs, sausages, Indian hot breakfast with tea and coffee. For lunch they usually serve Indian meals and same for dinner. All meals are three course with soups + starter, main meal and deserts. They also offer Momos and Thukpa in snacks (popular Tibetan dishes) so that tourists can enjoy local delicacies. You can get both veg and non veg items. Although you can bring and enjoy your own drink, there is no in-house bar or wine bar here. Take a walk through the gardens and see tea plucking (during season). The guide will show you how Darjeeling tea is plucked from the gardens (two leaves and a bud). Visit the factory which is about 30 minutes walk from the bungalow and see the different stages of tea processing. Join a traditional tea tasting session and understand how tea is graded. Take a walk down to the river Rungdung that flows through the estate. It will take about one-hour downhill walk to reach the river. Alternatively ask for a vehicle ... takes 20 minutes. Walk or trek along one of the several curated walking trails that pass through lovely tea gardens, small local villages and forested land. Excellent way to explore the nature. The lobby area is long and spacious, and has excellent views... an ideal place to read books during the day. In the evenings you can engage in one of the several in-house activities like playing English Billiards on a vintage table, carom or a board game, or visit the library with a drink, or pick a music of your own choice, or even try your hand at the antique piano. Make a day trip to Darjeeling town, Mirik or Kalimpong. So what is different in Ging? 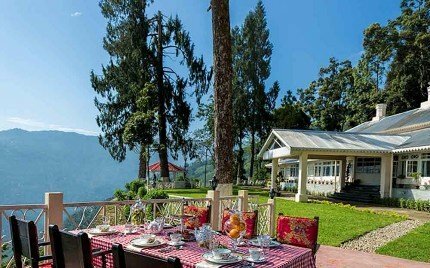 A great advantage of Ging Tea House is its location, close to Darjeeling town with fantastic views and great service. So you can actually enjoy best of both the worlds - Darjeeling and a great tea estate stay. Secondly, the Tea House is a restored heritage bungalow that was built during the British colonial days. 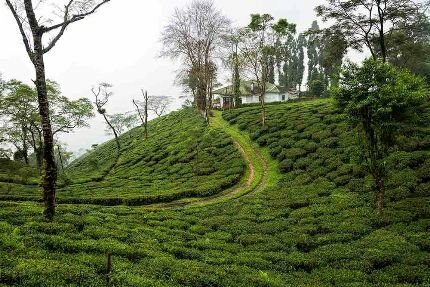 You can relive the time the way the British planters did and enjoy the rolling tea gardens and scenic views in complete tranquility. Pick up and Drop at Bagdogra Airport/ NJP Station / Kalimpong / Darjeeling. Chauffeur driven car for day trips to Darjeeling Town / Mirik / Kalimpong. Accommodation in your preferred suite. Guided walks through marked tea trails with packed lunch. Access to all in-house activities. From Bagdogra or NJP, you need to first reach Darjeeling lower town known as Chowk Bazaar (takes about 3 hours). From Chowk Bazaar you need to go towards Singmari along Lebong Cart Road, then towards Lebong Valley - from there towards Bara Ging and you will reach the tea house. It's about 30 minutes drive from Chowk Baraar.